At least seven rockets and missiles fired from Gaza into Israel. Gaza-based factions, meanwhile, are discussing a ceasefire. The rockets and missiles from Gaza continued to fly on Friday afternoon and early evening (Israel time), as it became clear that residents of southern Israel will have to spend their Sabbath in protected spaces and shelters. Shortly before 8:00 p.m. (Israel time), terrorists fired two Grad missiles from Gaza at the city of Ashdod. Channel 2 News is reporting that the Iron Dome anti-missile system was able to shoot down one of the missiles, while the second one exploded in an open space near the city. There were no physical injuries or damages. Earlier, five Qassam rockets were fired from Gaza at southern Israel. 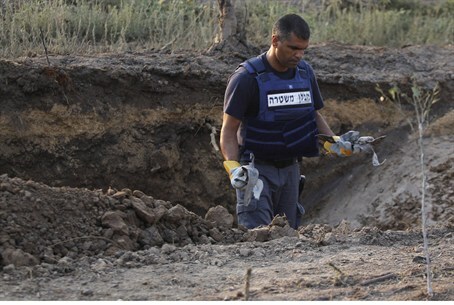 The rockets landed in open areas in the Ashkelon Coast, Sha’ar Hanegev and Eshkol Regional Councils. In all cases there were no reports of physical injuries or damage, according to Channel 2. Channel 10 News reported that residents of southern Israel have been asked to remain close to shelters or other protected spaces. The residents have been asked to enter the shelters when the “Red Alert” siren is sounded and wait ten minutes before coming out. On Friday morning, Arabs in Gaza said that one person was killed and 20 were wounded in IDF air strikes overnight. The IDF reportedly struck three different targets, including Hamas training camps in Gaza. A spokesman for the terror movement blamed Israel for "the escalation in the region." The IDF said that its aircraft hit sites of terror activity in southern Gaza, another terrorist site in northern Gaza, and that accurate hits on the targets were reported. Meanwhile, Channel 2 reported that the various Gaza-based factions convened on Friday afternoon to discuss renewing the ceasefire with Israel. Among those who took part in the meeting, according to the report, were senior members of the Hamas terror group which controls Gaza, including Hamas’ Prime Minister Ismail Haniyeh. Earlier, during Friday prayers, Haniyeh said that his government was in talks with Arab and international factors to "stop the aggression on the Gaza Strip", as he put it.